Workshop Session | Wednesday, June 27 | 1:55 – 2:40 p.m.
With so much competing for our attention, 70 percent of what we learn is forgotten within 24 hours, and 90 percent within a week. So how do we reinforce training once it is done? How do we increase knowledge retention, improve on-the-job performance and maximize our return on investment? 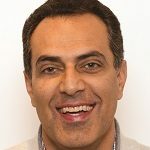 Founder and president of SwissVBS, Shahin Sobhani, will examine how current learning approaches may be falling short and share examples of mobile reinforcement strategies that boost retention, engagement and on-the-job performance. The presentation will provide a deep dive into a reinforcement case study at a Fortune 500 company, which resulted in over a 30 percent improvement in retention rates. Five practical steps to create a reinforcement strategy, including design, structure, content development, deployment and analytics. Learn where your learning approaches may be falling short. Understand mobile strategies to boost retention and overall performance.